Red Hook Veterans of Foreign Wars (VFW) Post 7765 is asking you "TO PAY IT FORWARD" with your donation to have a top-of-the-line BANQUET HALL suitable for the next several decades as we plan continued participation as a sustainable and viable member of our beautiful Red Hook, Hudson Valley community! The Post has just celeberated 70 years as a distinguished volunteer veterans service organization dedicated and committed to helping post members and many other veterans with many and varied needs. We also support our neighboring community organizations when called upon for donations or to provide facilities. 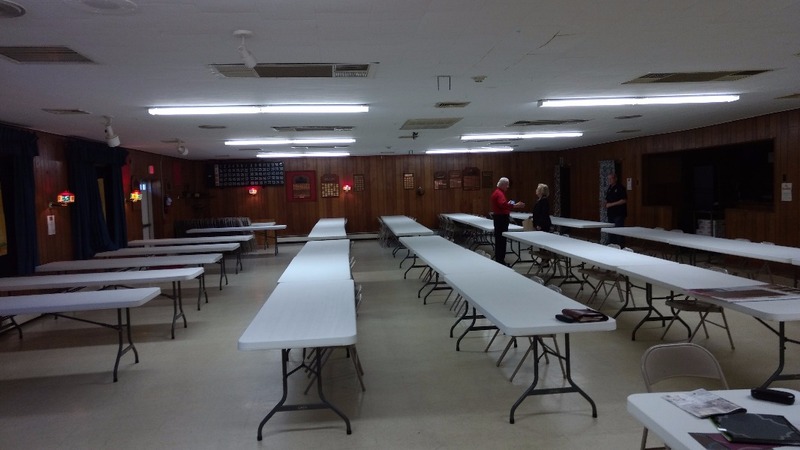 With many similar community or fraternal organizations suffering decline in membership and funding, Red Hook VFW Post 7765 is also prepared to "pay it forward" taking stock in the future of our organization and community by completely renovating one of our most important assests - the banquet hall. Throughout its 70 year history VFW Post 7765 has been a vital hub for local community events and activities such as bingo, penny socials, dances, dinners, weddings, anniversaries, engagement parties, and birthday parties. It is a hallowed hall remembering our deceased and disabled commrade veterans and a celebration hall to recognize the regions residents and veterans alike. Through the years we have provided meeting space and monetary activity support for Boy Scouts, Girl Scouts, Little League, Car Club, Motorcycle Club, Stamp Club and various business groups. Now is the time to rally around your local veterans organization - many members live and work with their families here and are part of this vital Red Hook, Hudson Valley community. By making a donation or any size, you will be assisting us to continue to help others as we always have in the past. This is a photo of the hall as it was mid-June. We have already started renovating using funds from our general operating accounts. These funds must be replaced with donations and many, many planned events in the coming years. 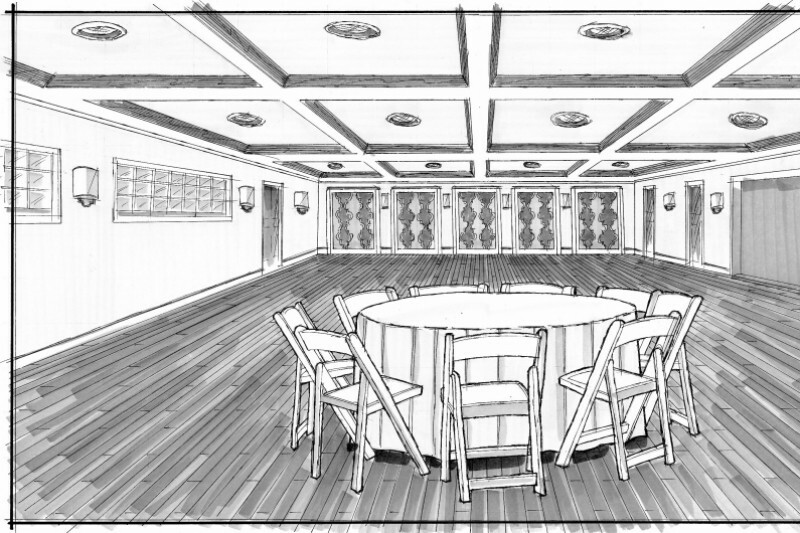 Take a look again at the concept drawing and you will see that we want to have the best banquet hall for our post and community events that money can buy. 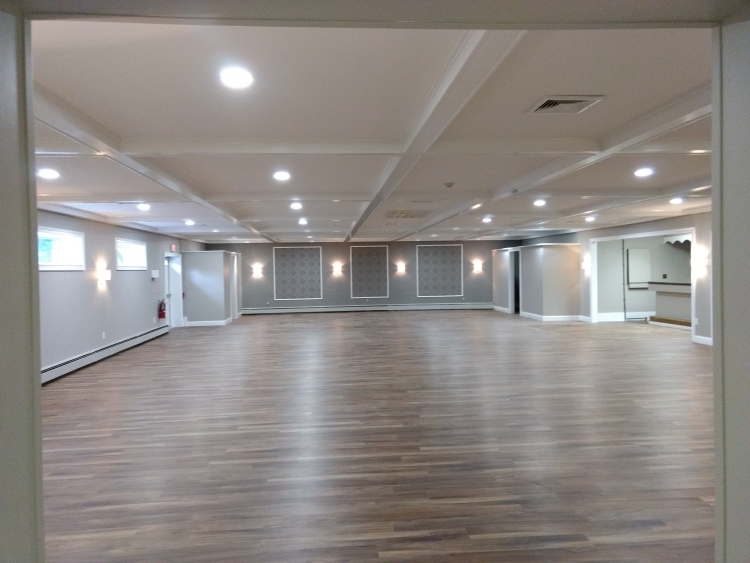 We look forward to working with you to achieve our goal and then making our new banquet hall available to the community at reasonable rates for all your special events! THANK YOU! Thank you for all your support... The VFW has come along way on our project... the hall is nearly complete and we are planning our offerings of rates and contracts for outside events as well as our own events to be help in the coming months... We still have a ways to go to meet our total funding goal, so please share with your friends! Our new hall - 99.9% complete! The VFW wishes to thank everyone that has contributed to our GoFundMe Hall Renovation campaign so far. WE have had over 45 donors contributing over $10,000! THANK YOU!!! We have many donations still coming in either online or offline. If you have not donated to date, you can send a check to the post or drop off a contribution to the post. You can also help spread the word by sharing our campaign with all your friends and associates! The hall construction is moving into its final phase with some details on our "punch list" being addressed. So we are very close to 100% project completion. But the fund raising must continue toward our goal of $50,000! The hall renovation committee is also working hard on procedures, policies, rules and contracts for renting our new hall to individuals, organizations, caterers and any others requiring our new facilities in our community. Shortly we will be prepared and better organized to schedule more bookings for events at the post. 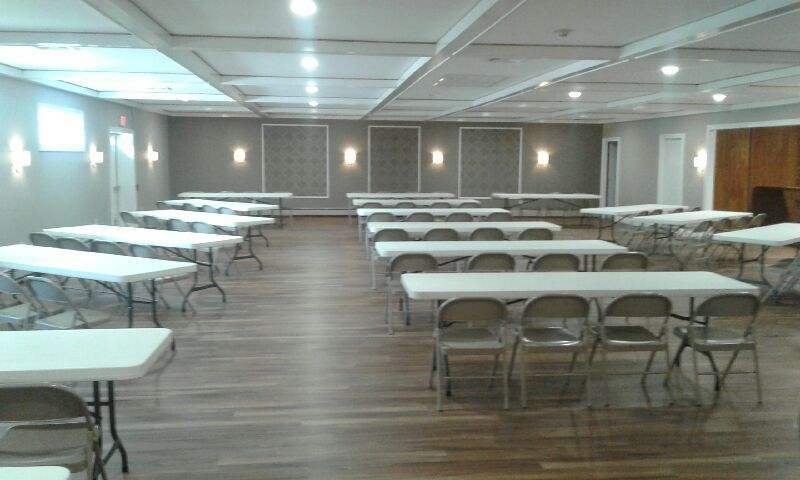 We are not finished with renovation yet, but we took time out to clean up the hall, set up the tables and chairs and have it very presentable for our first wedding reception booked in the new space this past Friday! Our new hall renovation is moving right along... but please, please continue to share our posts with all your friends on and off Facebook! And if you can, please make a donation of any size to help our Veteran's organization in Red Hook achieve our goal. Temporary setup for Friday's Reception! So many people have donated to our project in a short 2 weeks! Thank you all! We still have a ways to go and I'd encourage everyone who reads this update to please like and share our message, leave a comment and specifically tag or otherwise invite your friends and contacts to participate also... As the say, "Many hands make light work!" I'd translate that to "Many Friends Donating Reaches Our Goal!" 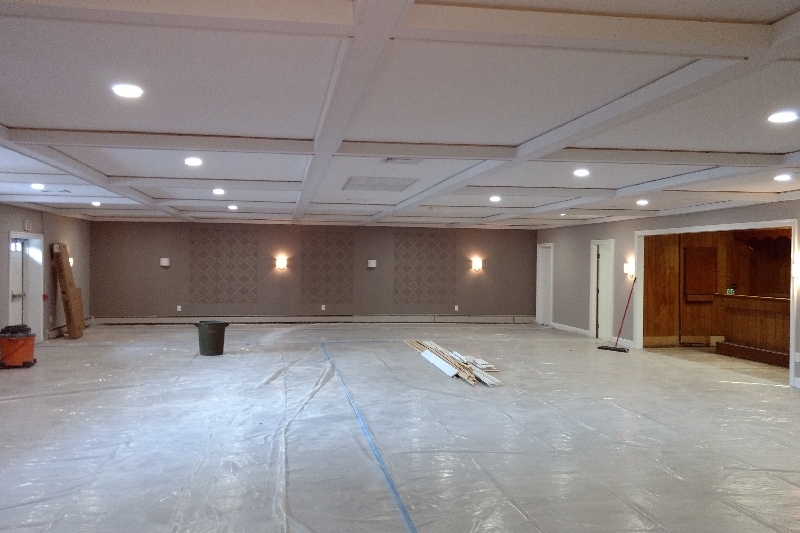 The photo is the hall renovation as of today! It's a remarkable project! This will be the most upscale banquet facility in the area! And the VFW is eager to make it available to the community as well as our own events... More news coming! AGAIN, MANY, MANY THANKS! We are really moving along!